When I was a student at Dominion Junior High in Columbus, Ohio, I had a rather idyllic life and absolutely no concept of emotional wounds. But in the past few years I’ve found myself reflecting on the lessons I learned from a physical wound I experienced in gym class one morning. We were running track events that day, something I never was very good at. While trying to jump over a hurdle on the school’s crude cinder track, I caught my foot and plummeted to the ground. Although the main thing hurt was my pride, I also incurred a bad scrape to my knee during this mishap. This didn’t really seem like a big deal at the time. I just vowed to be more careful and jump a little higher the next time I ran over hurdles. 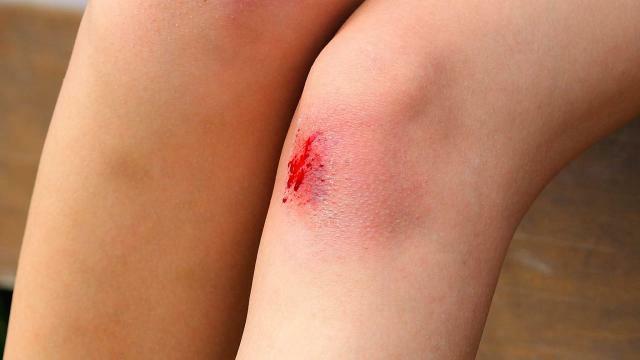 After gym class I took a shower and tried to wash my knee the best I could. I figured it would be red for a while, but certainly nothing serious. However, a few days later, I noticed there was some white pus on the area of the grapefruit-sized wound. And by the following day, the original red wound couldn’t be seen at all—just a disgusting thick layer of yellowish white pus. Things got so bad that my mom had to take me to the doctor to address this repulsive condition. He warned that the infection might have spread throughout my body if I had waited any longer. With the help of some antibiotics, the infection finally cleared up after about a week. But this experience provided a lesson I would never forget: Often our original wounds are relatively minor, but the secondary infections can cause us serious problems. Emotional wounds work the same way. We’ve all been wounded emotionally at one time or another, to one degree or another. Just like my scraped knee in gym class that day, our emotional wounds are seldom debilitating or life-threatening in themselves. However, I’ve met many people over the years who’ve allowed their emotional wounds to become infected. Because they weren’t diligent to keep the initial wound clean, toxic conditions such as unforgiveness, resentment, and bitterness set in. What started as a temporary, treatable condition grew into something much more severe and chronic, robbing them of their joy and peace of mind. If you’ve been emotionally wounded by traumatic events in your life, there’s no need to panic. Jesus is the Wonderful Counselor (Isaiah 9:6), ready and able to heal your wounds. But you have a vital role to play in keeping the wound clean so a secondary infection doesn’t set in. This means forgiving anyone who has hurt you, allowing the crystal clear waters of God’s love and mercy to regularly cleanse you of any resentment or bitterness. And if you see that some yucky white pus is developing at the site of the wound, you may need to ask God for spiritual antibiotics to keep the infection from taking over your life. Is this an easy process? No, not at all. But the longer you wait, the harder the healing process will become. And don’t be deluded by the old line that says, “Time heals all wounds.” That is only true if the site of the wound is kept free of secondary infections. Therefore be imitators of God as dear children. And walk in love, as Christ also has loved us and given Himself for us, an offering and a sacrifice to God for a sweet-smelling aroma (Ephesians 4:31-5:2). My knee is perfectly fine today. There’s no on-going infection or scar. And I’m convinced our emotional scars can disappear as well. But unforgiveness will delay your emotional healing or even lead to dangerous, widespread infection. You must allow the Holy Spirit to search your heart and cleanse away any remaining bitterness or toxicity from life’s traumas (Psalm 139:23-24). Once your emotional wounds have been disinfected, you’ll be amazed at how much better you feel. You may even be able to hurdle some obstacles you’ve been avoiding for years. Posted in Inspiration. Tagged bitterness, emotional wounds, forgiveness, infection, scars.